Matt O’Connor admits five match points is ‘the ideal’ but says his side need to concentrate on simply winning. Jamie Heaslip and co. say they aren't focusing on a bonus point. MUCH OF THE talk this week has been of Leinster securing a bonus point in beating Castres at the RDS tomorrow, but the province themselves insist such thinking is counter-intuitive. Five match points would put Matt O’Connor’s men into a strong position from which to top Pool 2, particularly if Harlequins fail to achieve the same against Wasps in the group’s other fixture on Saturday. ‘Quins and Leinster are level on 13 points at present, although Conor O’Shea’s side lead the pool on account of their 37-32 aggregate win over the Irish province in rounds three and four. While Castres have named a sturdy team to face Leinster in Dublin tomorrow evening [KO 17.30], their form is poor and the French outfit’s most recent away European fixture against Wasps saw them concede seven tries. Castres shipped another six tries on the road versus Stade Français in last weekend’s Top 14 action. Surely the stage is set for Leinster to remedy their poor try-scoring record in Europe this season [four in four games]? “That’s the ideal,” admits Leinster head coach O’Connor. We would love to get five points out of the game but the reality is that we’ve had three very tough games against Castres over the last 12 months. They’re incredibly physical and have made us work for everything in those contests. Of course, we would expect nothing different from Leinster – coming out with a statement about galloping in four tries at the RDS was never likely. That said, their status as 22-point favourites – or even higher in some places – is justified given the opposition. Whatever they say, the chance for a try-scoring bonus point is certainly there for Leinster. It’s a unique and testing position to be in, and captain Jamie Heaslip outlines some of the reasons why. “My focus wouldn’t be maximum points to be honest,” says the fit-again Ireland number eight. “That would be very nice, but my focus would be us to win. You can’t get the five points unless you win, let’s start there first. “If you start focusing on the five points you might start pushing the game in situations you don’t need to. Being more focused and diligent and going through phases trying to break them down will get you the outcome that you’re looking for. Then you might get a bit more breathing room, apply more pressure and then you might be able to chase a second, third or fourth try. I don’t think you can look for it from the outset and that removes a lot of pressure from the players. Patience may be the key virtue for Leinster tomorrow. Email “Leinster talk down bonus-point focus ahead of tie with out-of-form Castres”. 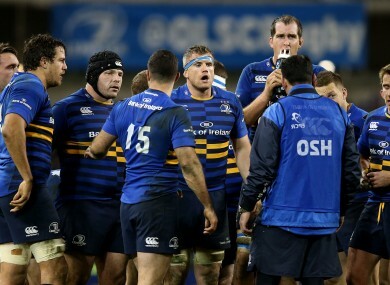 Feedback on “Leinster talk down bonus-point focus ahead of tie with out-of-form Castres”.